Outside Vienna's bar, it's a decent, slightly ordinary, slightly loopy (thanks to Mercedes McCambridge) Western. Inside, it's a David Lynch movie. This film one of my favorite bits of dialogue ever. The townsfolk converge on the saloon to bring Vienna in. She appears at the top of the staircase, holding two six-shooters. "You can't shoot all of us, Vienna!" "Two of you will do." There's an episode of the You Must Remember This podcast discussing Joan Crawford's role in Hollywood that covers this film specifically. I first saw this a couple years ago at a library movie-watching group, where I think I was the only attendee who enjoyed the film. 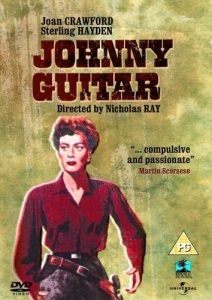 It may have been the first movie starring Joan Crawford that I had ever seen. I have since made my entire family watch it. It's so weird and so good.